Everyone that will be involved in the projects on PPO, will have to be loaded as employees. This will allow users to allocate items such as Tasks, Issues, Risks, etc. to employees in order to action or manage. This will also allow Sponsors, Owners, Managers and other Stakeholders to be identified on the project level. Employees are added and managed from the Employees menu item. It is important to note that employees, unlike other entities in PPO, are not associated with a project. All employees loaded on the Employees entity will appear in the Employee List type data field (for more information on data fields, read the following knowledge base article). To load employees simply click on the Employees menu item and then click on the Add Employee icon. Complete the required information and then click on the Submit Employee icon. 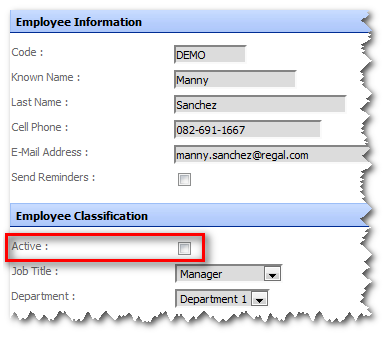 Below is an example of an employee list type data field. Employee lists can be filtered globally across PPO (e.g. to not show inactive employees) or per user group (e.g. to only show employees from the same company to all users in a user group). For more information, read the following knowledge base article. To maintain data integrity and history, employees cannot be deleted. Global filters can be set up to filter out inactive employees (for more information on filters, access the following knowledge base article). If such a global filter is set up, employees that are no longer required can be marked as inactive (Active is FALSE) and will then be filtered out by the global filter. PPO allows users to plan resources against Tasks on project plans. PPO uses information like the task duration, allocation percentage, standard working hours and specified charge out rate to determine resource capacity per project as well as over the entire portfolio. For more information on resource planning and management, access the following knowledge base article. PPO differentiates between employees (resources) and users. Resources are loaded as employees in PPO. Items such as Tasks, Issues and Risks can be assigned to employees to action. Everyone who is involved in a project (stakeholders), as well as team members who will be working on the project, should be loaded as employees on PPO. In order for an employee to be able to log into the PPO instance to update items, the employee has to be loaded as a user on PPO. For detailed information on the differences between employees and users, read the following FAQ.